Frogs can turn up in surprising places, and anyone can become a frog expert with just a little bit of interest and practice! These are some of the key messages to come out of the community information night on citizen science frog monitoring along Dandenong Creek held last night. Citizen scientist Anthony Bigelow of the First Friends of Dandenong Creek knew very little about frogs when he took part in his first frog survey in late 2017. A year later, he is a veritable expert on local frogs, able to identify the seven local species by call, and having a keen understanding of the specific types of habitats in which they can be found. Together with other members of his group, Anthony submitted a staggering 131 frog reports in the 2017/18 financial year, providing a wealth of data for scientists to assess the health of frog populations over time and in response to environmental changes. The surveys are done using Melbourne Water’s FrogCensus app, which is free to download and easy to use. Using your smartphone, all you do is record frog calls and send them in for an expert to identify. You will then be notified of the results. You can also listen to frog calls using the app and learn for yourself. During initial surveys, Anthony and his fellow volunteers became familiar with the calls of six frog species. But one night, they heard something quite different – a much more high-pitched, buzzing type of call. They submitted the record and it turned out to be a new species! 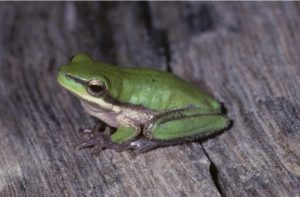 It was the Eastern Dwarf Tree Frog (pictured, credit: Peter Robertson), otherwise known as the Banana-box Frog, as it does not naturally occur locally, but hitch-hikes down from the sub-tropics in agricultural produce such as bananas. This is the first local record in five years. 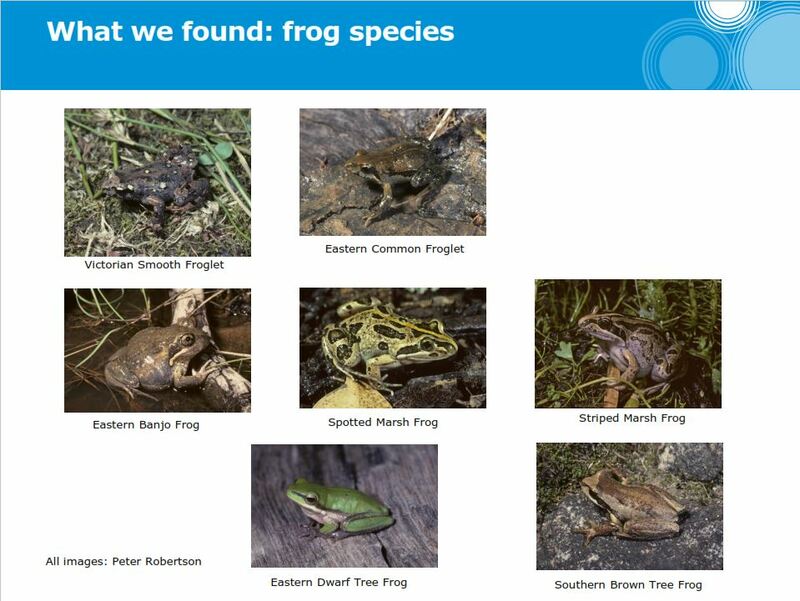 Photos of all the frog species found by the group to date are shown below. Another word of advice from Anthony was not to have too may expectations about where you will or won’t find frogs. “Sometimes we’d hear them calling from people’s back yards, or from tiny depressions right away from the creek. It wasn’t always what we expected!” he said. So there you go – anyone can survey frogs, no matter where you live, and not only have fun but also make a valuable contribution to science. The key survey months (when most frogs are calling) are April, August, October and November, so now is a great time to download the app and start recording! The seven species of frog recorded by the First Friends of Dandenong Creek in 2017/18. Image supplied by Melbourne Water, photos by Peter Robertson. 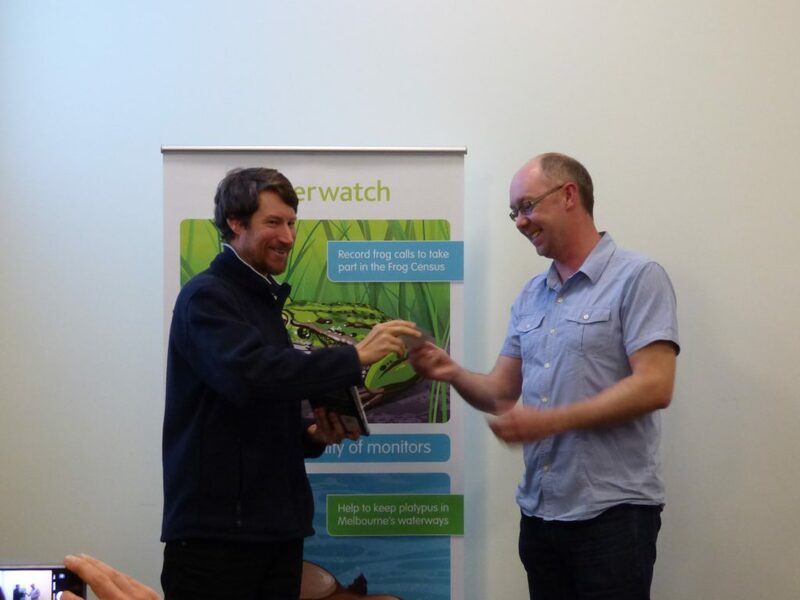 Melbourne Water’s FrogCensus Coordinator James Frazer presenting citizen scientist Anthony Bigelow with a token of appreciation for his amazing efforts surveying frogs in 2017/18.